Presented by Dr. Cimino-Mathews and prepared by Austin McCuiston. 60 year-old female with a pancreatic mass. 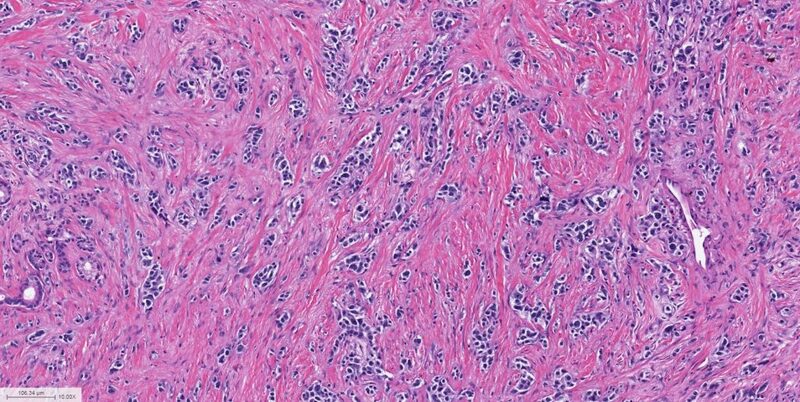 Histology: This pancreatic resection specimen displays areas of unremarkable pancreatic parenchyma, with separate regions displaying chronic pancreatitis, suggestive of ductal obstruction. Within the pancreas is a fibrotic tumor characterized by cells arranged in nests, trabeculae, single file, and single cell patterns. The cells have amphophilic granular cytoplasm and oval to rounded nuclei with finely dispersed “salt and pepper chromatin,” occasionally prominent nucleoli, and scattered degenerative-type atypia. Mitotic figures are inconspicuous. 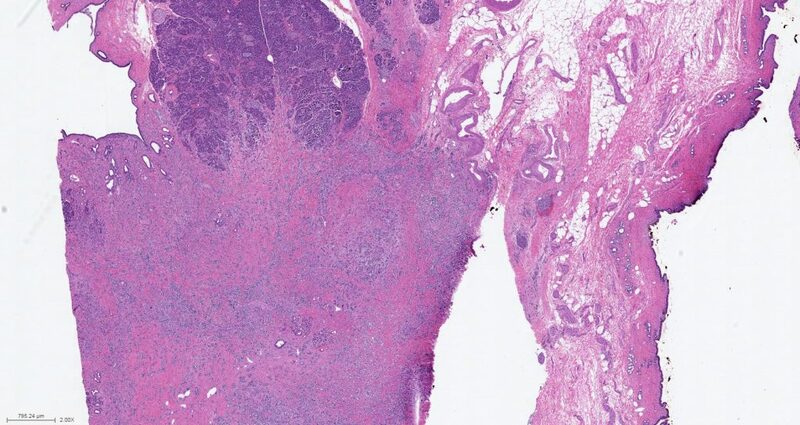 Perinerual invasion is readily identified, and metastatic foci are present within a peripancreatic lymph node. Immunotains show the lesional cells to be immunoreactive for synaptophysin and serotonin, and negative for BCL10, with a Ki67 proliferation index of <2%. 3. McCall CM, Shi C, Klein AP, Konukiewitz B, Edil BH, Ellison TA, Wolfgang CL, Schulick RD, Klöppel G, Hruban RH. 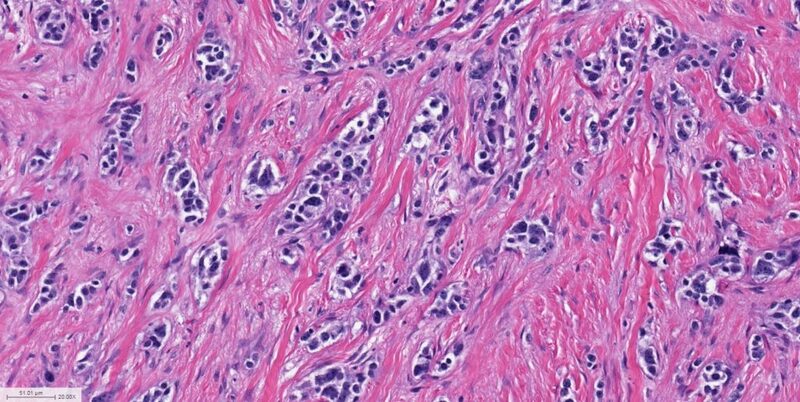 Serotonin expression in pancreatic neuroendocrine tumors correlates with a trabecular histologic pattern and large duct involvement. Hum Pathol. 2012 Aug;43(8):1169-76. 4. Shi C, Siegelman SS, Kawamoto S, Wolfgang CL, Schulick RD, Maitra A, Hruban RH. Pancreatic duct stenosis secondary to small endocrine neoplasms: a manifestation of serotonin production? Radiology. 2010 Oct;257(1):107-14. 5. Tang LH, Basturk O, Sue JJ, Klimstra DS. 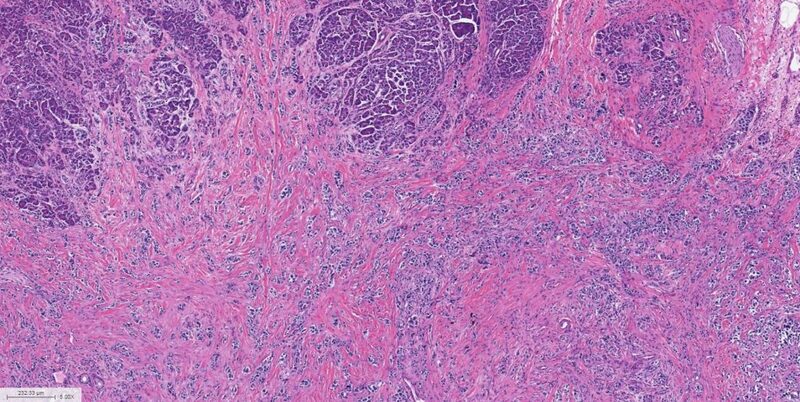 A Practical Approach to the Classification of WHO Grade 3 (G3) Well-differentiated Neuroendocrine Tumor (WD-NET) and Poorly Differentiated Neuroendocrine Carcinoma (PD-NEC) of the Pancreas. Am J Surg Pathol. 2016 Sep;40(9):1192-202.